Whether you’re serving breakfast, lunch, or dinner, your customers will be impressed by the elegant presentation, and you’ll drastically cut down on cleanup time and efforts because guests can simply throw them away when done. These plastic plates that look like china also won’t shatter into dangerous shards if they’re accidentally dropped, making them a safe solution for outdoor and highly trafficked areas. Also make sure to check out other great items from Choice Crystal, Silver Visions, Visions, Creative Converting, D&W Fine Pack, Dart and Dart Solo. Our selection of disposable plastic plates includes sizes to accommodate any meal, from appetizers and desserts to entrees and sides. You’ll even find compartmented plates that are great for use at buffets, since their multiple sections keep different foods separated. Plus, disposable dessert plates make cleaning up after your catered event or banquet simple, as you can throw these products away when you're done. 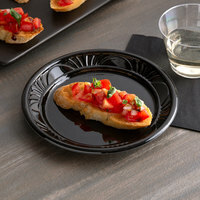 Complete the look of your tabletop with plastic flatware/utensils, disposable bowls and plastic bowls, and plastic take out deli/catering bowls and lids. If you're wondering where to buy d&w fine pack plastic disposable plates, we have a large selection of d&w fine pack plastic disposable plates for sale at the lowest prices.